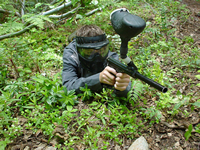 Located only 5 minutes away from Whistler Village, paintball is safe, fun, and supervised by professional referees. Learn to paintball, beginners are welcome. In fact, all levels of experience are welcome from the never-have beginner to the seasoned veteran. This is a great activity not only on sunny days but especially on rainy days as well. Open 7 days a week and with the ability to accommodate up to 60 players at a time, it is a great opportunity for to make the most of your Family outings, Stags, Staff Parties, Birthday Parties, Corporate events, Ski camps, Snowboard camps, Hockey camps and many more.